This recipe will make 4 to 6 servings. 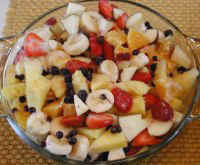 Wash the apples, bananas, oranges, pineapple, and berries (if the berries are fresh). Cut the apple into quarters and remove the stem and seed core. Cut the apple quarters into slices and then cut each slice into bite sized pieces. Add the pieces to a mixing/serving bowl, or a covered baking dish if storing in the refrigerator. Peel the bananas and slice into the bowl. Peel the oranges, separate the oranges into sections, and cut the sections into bite sized pieces and place in the mixing bowl. Cut off the leaf end of the pineapple, and cut the pineapple in half from top to bottom. 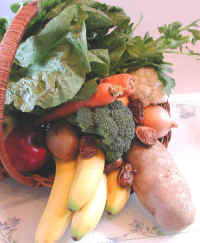 If the pineapple is a large one, you can store half in the refrigerator in a covered container, for a couple of days. Cut the pineapple into 3/4 inch wedges from the center to the outside rind. Cut off the rind with a knife, and cut the pineapple into bite sized pieces and add to the mixing bowl. Cut off the stem end of the strawberries, and cut into bite sized pieces. Add to the bowl. 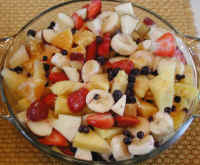 Remove any remaining stems from the blueberries, and sprinkle on the fruit salad. 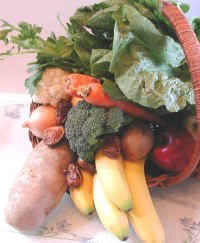 Mix well, cover, and store in the refrigerator until ready to eat, or serve immediately. Mix before serving and enjoy.